Dr. Dinesh Bhojraj is an experienced Internal Medicine Specialist in Ring Road, Nagpur. He has been a practicing Internal Medicine Specialist for 9 years. He studied and completed MBBS, MD - Medicine . 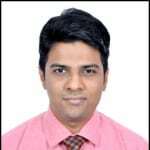 He is currently associated with Rabindranath Tagore International Institute of Cardiac Sciences in Ring Road, Nagpur. Save your time and book an appointment online with Dr. Dinesh Bhojraj on Lybrate.com. Lybrate.com has a number of highly qualified Internal Medicine Specialists in India. You will find Internal Medicine Specialists with more than 41 years of experience on Lybrate.com. Find the best Internal Medicine Specialists online in Kolkata. View the profile of medical specialists and their reviews from other patients to make an informed decision. I had a viral last month and i took OTC medicines which didnt work for three days. I went to Dr. Dinesh and he asked me to do some test on immediate basis. He medicated me effectively. My best wishesh to Dr. Dinesh. Great dr. His Treatment for patient is unique. Hi. I am 9 weeks 5 days pregnant. My hb electrophoresis report shows fetal haemoglobin percentage 0. Does this mean anything negative. M worried. Fetal haemoglobin is present in adults only during childhood and slowly replaced by adult haemoglobin adults normally have fetal haemoglobin upto 0.6%. Your fetal haemoglobin of 0% has nothing to do with your child normally hb electrophoresis is done in anaemic pts to diagnose conditions like sickle cell anemia or thallesmia or normally done as routine in some clinics for pregnant pts. Would like to see your complete hb electrophoresis report, with complete blood count with peripheral smear reports. Sir I am suffering from pile but it is not very hard jist little bit problem there Some time its bleed also. Take lots of high fiber diet ie salads and plus you can take fabolite powder with water every night for now and observe. If stools are formed well then good but if your problems persists even after 15 days then go and consult a general surgeon. I am 33, years old and noticing swelling in my feet kindly tell wh. Could be the reason for this is. It bcoz of sitting. For long hours or something. Else. Rt. Is the swelling pitting? reasons for swelling ie oedema in medical terms are 1. Varicosis 2. Hypothyroidism 3. Heart failure 4. Kidney failure 5. Liver failure 6. Benign. 1. If she is using nylon socks stop using them 2. Use cotton socks preferably bit loose 3. Drink lots of water keep hydrated.